There has never been a boring offseason for the Houston Rockets in the Daryl Morey era, and this one should be no different. With several key players becoming free agents (unrestricted or otherwise), the Rockets have a lot of tough decisions to make. The roster looks to get really expensive, but new owner Tilman Fertitta claims he's willing to pay a heavy luxury tax bill if the team is good enough. With Houston coming off a 65 win season and a tough seven-game Western Conference Finals with the defending champion Golden State Warriors, this team surely fits the bill. This one's tricky. The Rockets almost assuredly have plans of bringing Chris Paul back and are talking about it as if it's a done deal. However, the bigger question is the amount of years they'd be willing to ink. Paul is a 33 year old point guard with a pretty significant injury history so Houston would like to keep the contract as short as possible, ideally at around three years. However, if Paul isn't willing to to settle for anything less than his full five year max of $205 million dollars, the Rockets may have to swallow some ugly years at the end of that deal. The Rockets will have full bird rights on Capela, so in addition to the right to match any offer given to him, they can also go over the cap to keep him. It's likely Houston waits until July 1st to offer Clint the qualifying offer, and subsequently waits until a team gives him an offer sheet they can match. It'll be interesting to see what kind of money Capela will demand in this market (his maximum figure is approximately four years, $108 million). Trevor Ariza has been an invaluable piece for the Rockets over the past four years on a very reasonable contract. He's been a reliable defender, decent 3-PT shooter, and an overall perfect fit next to James Harden in the starting lineup. However, with Ariza turning 33 in late June, it's hard to see a situation the Rockets give him more than their tax player mid level exception. Many teams could use a player like Ariza but his age makes it tricky to predict what he'll get on the open market. Out of the wings the Rockets have in free agency, Ariza will likely be the most expensive to bring back due to his reliability. If Trevor Ariza leaves because the Rockets are strapped for cash to offer him, Luc Mbah a Moute seems like a logical replacement considering the chemistry and relationships he's already fostered with Houston. While he may not be as reliable a shooter, Mbah a Moute is a noticeably better defender than Ariza and he's a year younger. He also may be willing to sign for much cheaper. With Mbah a Moute turning 32 this year and coming off several shoulder injuries (two this year alone), it's very possible his market value is more suppressed compared to Ariza. Depending on how things shake out early in free agency, Mbah a Moute may be willing to take the tax-player mid level exception (around $5 million starting salary) as it's a significant raise over the veteran's minimum he signed this year ($2.2 million). If Gerald Green hadn't played as much in the playoffs as he did, it's possible he wouldn't even be on this list. Green is the prototypical "happy to be here" hometown locker room presence that the Rockets seem to feed off of. He may not play some nights due to his defensive liabilities, but he's a nice guy to have around as an injury replacement. The Rockets may be willing to offer him a minimum contract to stay this summer, but it's hard to see him demanding more than that from Houston. Daryl Morey and the Rockets have an extensive history of aggressively chasing star talents to pair with James Harden. Usually Morey keeps Houston's roster flexible enough to pursue these star players with cap space or a pathway to easily get cap space. This year they'll be severely handicapped with their current salary cap situation. In addition to the contracts already on the books, the Rockets will have the delicate balancing act of bringing back free agents and having their cap holds on the books. Essentially, the most money the Rockets could create if they renounce all their free agents is around $18 million. Sure, they could trade trade some of their more extravagant contracts like Ryan Anderson or Eric Gordon, but even then Houston would have to gut it's roster and give up assets to create the space necessary. 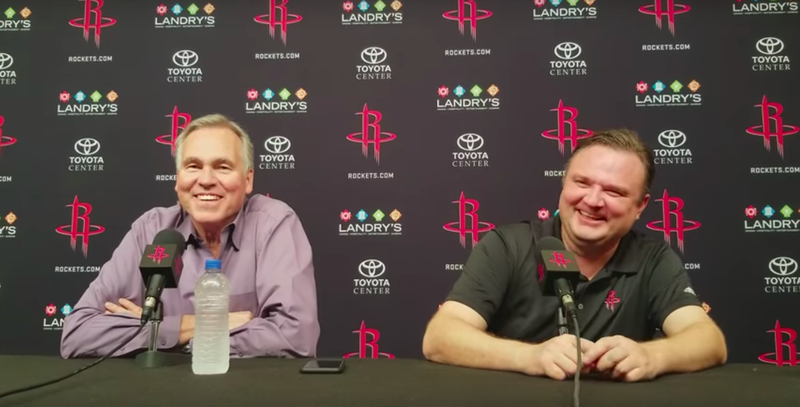 It's unlikely the Rockets pursue a max caliber free agent with traditional free agency unless they suddenly find a Ryan Anderson suitor before July 1st. The best way for Houston to lure a max caliber free agent (i.e. LeBron James or Paul George) would be if that free agent forgo free agency by opting into the final year of his contract and be traded to the Rockets (like Chris Paul did last year). This would have to happen before June 29th (final day for free agents to opt into their player options) and it would be an extremely complicated procedure. If the Rockets try to acquire a player like LeBron James or Paul George after July 1st via sign and trade, it would hard cap the team, which is something Daryl Morey will likely try to avoid at all costs. An opt-and-trade would likely require also trading Ryan Anderson into space and surrendering multiple draft picks to a third party as the Cavaliers or Thunder would not want to take back Anderson's contract. Finding this third team will be tough, but it's worth noting that Houston's been doing due diligence on trading Ryan Anderson's contract for at least a year now. It should also be noted that there is a second way to get a deal done, but it would require trading key pieces like Eric Gordon and P.J. Tucker. If an opt-and-trade were to happen, it would likely happen between the NBA Draft and June 29th. The reason for this is Houston is currently forbidden from trading their next first round pick due to the Stepien Rule, which prevents teams from trading back-to-back first round picks. After the draft however, their next first round pick becomes considered a "pending" first rounder and would no longer be considered a "back-to-back" pick. It's a technical workaround that the Rockets utilized last year in the trade for Chris Paul. If it isn't clear by now, Houston's star pursuit will likely revolve all around Ryan Anderson's contract and this June 29th deadline. If the Rockets don't bring in a 3rd superstar level player, they've publicly said that they would be more than happy with bringing back more or less the same roster and giving it another go next season. They have full Bird rights on Chris Paul, Clint Capela, and Trevor Ariza meaning they can go over the cap to keep them. They also have their taxpayer mid-level exception to work with to keep someone like Luc Mbah a Moute who they don't have full Bird rights for. The problem with this is it would be a lateral move and Houston's core (James Harden, Chris Paul, P.J. Tucker, and Clint Capela) is in its' prime and will likely experience age-related regression over the next 2-3 seasons. If an aging roster like this is kept the same, they'll likely need an infusion of youth and mending around the fences. This could happen with the growth of young players like Zhou Qi or Chinanu Onuaku, some luck in finding a ready made rotation player in the second round this year, or using the taxpayer mid-level exception on a young player instead of someone like Mbah a Moute. It's important to keep in mind that just bringing back the core and improving around the edges will be quite expensive, so the Rockets cannot afford to have bad contracts moving forward as they will have to pay luxury tax for every additional dollar spent over the cap. Essentially, it might be financially prudent for Houston to still try and find a new home for Ryan Anderson, making the luxury tax bill more palatable. However the Rockets decide to go about their summer, this will be a big test summer for new owner Tilman Fertitta. This roster is about to get expensive, whether it remains the same or if Houston acquires another star. Daryl Morey has built up enough equity with the fanbase through years of excellent management, but he's not the one that's going to be responsible for this team's payroll. As usual, this should be fun.